The third step in creating a brand new campaign is writing at least two different ads for every adgroup. This is called A/B testing. We do this in order to understand our target audience & learn what messages they respond to better. During the process of A/b testing we are looking at a couple different factors such Click Thru Rate (CTR), Conversion rate & Cost Per Acquisition(CPA)/Cost Per Lead(CPL). 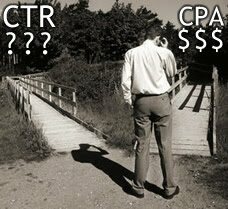 Sometime one ad may have a great CTR nut a really high CPA costing lots of money and making you no money and the other ad in the A/B split test will have a lower CTR but attract only quality traffic resulting in higher conversion rates and lower CPA's. So the most important factor in A/b split testing is tracking your goals & calculating how much money you spent per goal/lead/customer/sale, delete the ads that performed poorly & write another to try and outdo the old one. Eventually you will be left with a handful of killer ads generating you a high CTR and low CPA. A great way to get started on writing your ads is by reading through your top ten competitors, do this by searching one of the most relevant keywords in your industry & reading the top 10 sponsored links since they are there for a reason, and reason is either your competitor has very deep pockets to spend money on branding or that being there and bidding on that competitive keyword is profitable for them; and there is no reason it should be profitable for you as well!